At Master Mechanic High Park, it’s no secret that we love animals. If you’re living in Toronto, you’re probably familiar with two scenarios that are saddening, but unfortunately, too common. Seeing a stray cat rummaging through your garbage. A protective female cat that has had a litter on, or near your property. It’s estimated that there over 100,000 stray and feral cats are currently roaming around Toronto. One-hundred-thousand. Let that sink in. With numbers running rampant, support groups like The Toronto Humane Society and Toronto Cat Rescue can only offer so much aid with the limited resources they have. How did we get to this point? Many feral cats might have been indoor cats at some point. They may have been displaced, let loose, or lost. Many are simply born and raised in the wild. One thing is certain: it’s a huge problem that isn’t slowing down anytime soon. That’s because these cats reproduce at an alarming rate of about 2 to 3 litters per year. With up to 10 kittens in each litter, it’s easy to see why the numbers are so out of control. Unfortunately, our frigid winter temperatures often mean a low chance of survival and an unhealthy life for feral kittens. Despite what many people believe, most feral cats cannot be socialized as adults or be brought indoors. This certainly complicates the issue! While they look friendly, most feral cats can be very dangerous when approached. Despite their aggression, they deserve to live a dignified life, and should not be euthanized as a solution. To help stop the issue at its core, these stray cats need to be spayed and neutered so that they no longer reproduce more sick and hungry kittens. First, they need to be found. Recently, one of our beloved customers, Joanne, contacted us about an unapproachable stray cat in her backyard. She was looking for tires that could be repurposed into a shelter. While Josie wears her puppy-pride proudly, she loves all animals equally and fights to ensure their safety. Needless to say, she was instantly onboard. 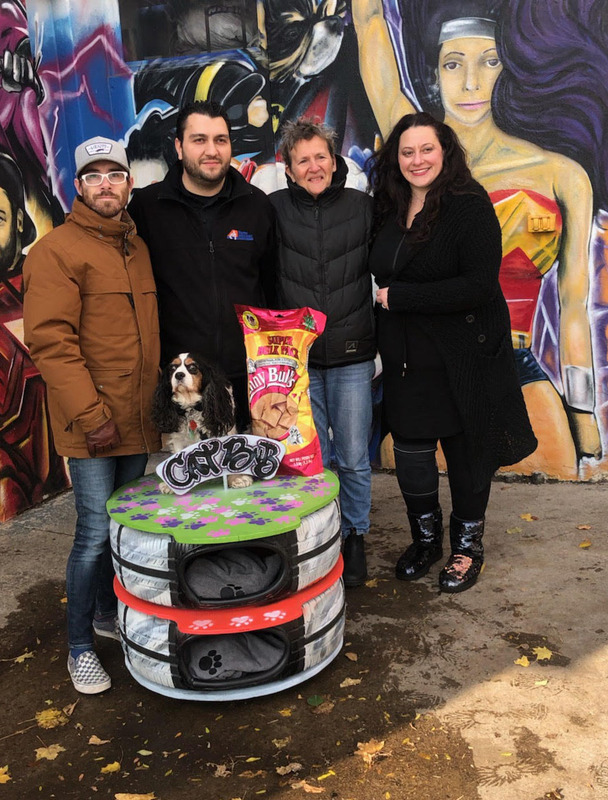 Working with local handyman, Justin George of OddJob.ca, we’re so proud to have collaborated on such a unique project to help a caring customer and feline friend. 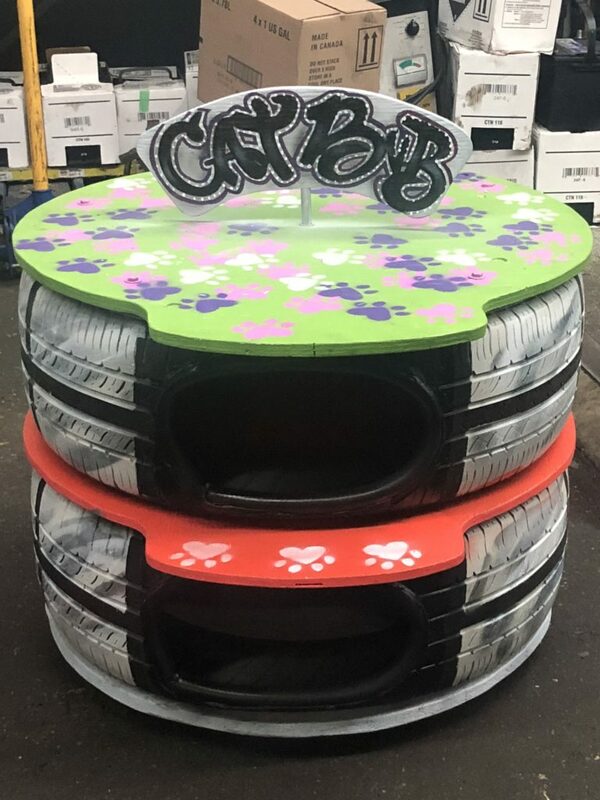 With used tires donated by Josie, Justin crafted a CATBNB to bring Joanne’s brilliant idea to life. 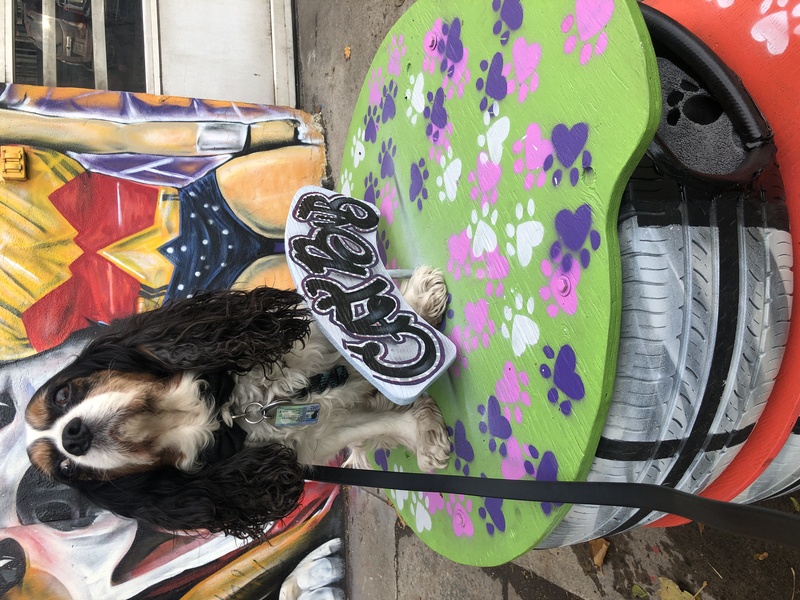 Josie invited local artist, MagicFinnga WonG, to paint the CATBNB and presented the final product to Joanne at Master Mechanic High Park. 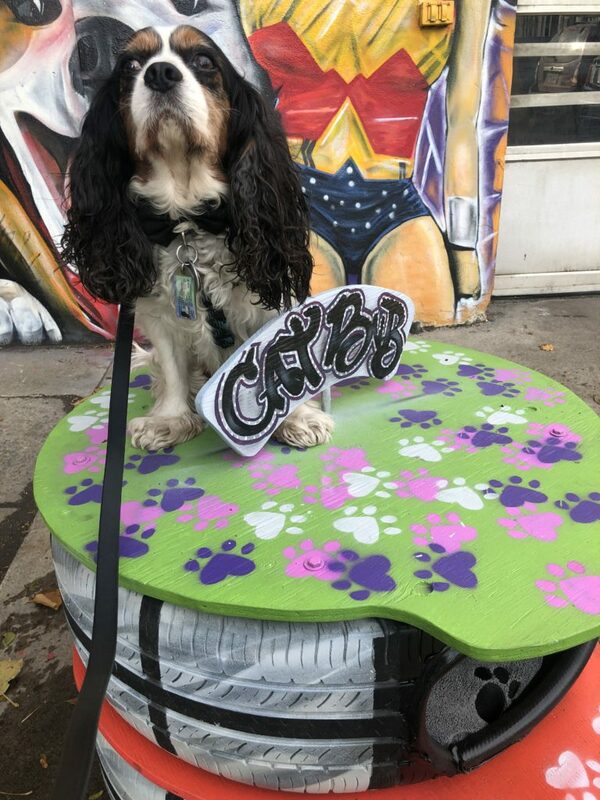 As a rescue himself, Charlie was very excited to help a fellow #furbaby. Shout out to Justin for doing such an amazing job. He put this shelter together with the impeccable craftsmanship he puts into all his work. Complete with pillows and a bag of treats, we know the stray will love his new home as much as we do. We’re hoping that others in our city will get onboard to help combat this growing issue. 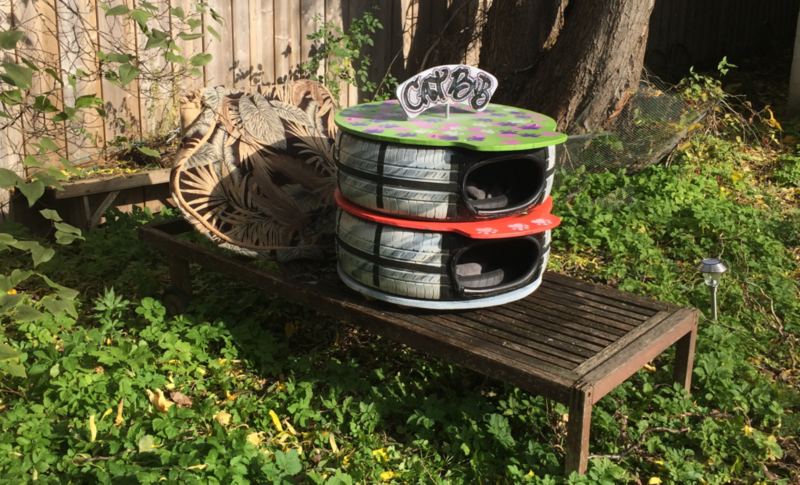 If you’re interested in a CATBNB or know someone that is, please contact Josie at Master Mechanic High Park or Justin at www.OddJob.ca (@OddJobHandyman) to discuss how you can get started. Thank you, Joanna, for including us in your vision!